Winger Greg Chambers rose to prominence across the pond in the Ontario Hockey League (OHL) as a junior where three seasons with the Peterborough Petes saw him tally 200 points in 194 games. By 2003/04 he was then appearing in the East Coast Hockey League (ECHL) – just two tiers below the NHL – where he managed 12 goals and 30 assists in 57 outings for the Pensacola Ice Pilots in Florida. An NHL lockout the following year then forced him to move further afield and during 2004/05 he iced for Varese in Italy’s top division where he claimed almost a point per game with 34 in 36 fixtures. However the north Italian club would be dismantled at the end of the campaign and the resulting search for a new side would eventually take Chambers to the UK. 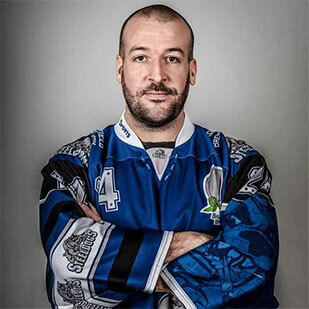 In 2005/06 Greg Chambers arrived at the then Elite League’s Basingstoke Bison – a club that he would make his home over the next four seasons with more than 200 appearances for the Hampshire outfit. 93 goals and 160 assists saw the forward rack up 253 points in league competition alone whilst he was also voted into the Elite League’s All-Star Second Team having finished in the top five scorers despite the Bison propping up the rest of the division in 2008/09. Financial constraints would then force Basingstoke to drop to the EPL but Chambers would remain in the UK’s top tier as he joined the Coventry Blaze where a remarkable 28 goals and 54 assists in 60 games helped his new team lift the title. After another 47 points the following year the now 28 year old opted to move into the EPL himself and another championship followed as he battled to top honours with the Guildford Flames in 2011/12. A successful homecoming took him back to Basingstoke for 2012/13 before Chambers then iced for the Sheffield Steeldogs last season to take his totally EPL points haul to 182 with 51 goals and 131 assists in 142 fixtures. As well as a successful club career Greg Chambers has also appeared on the international stage for Great Britain in tournaments between 2007 and 2010. His 11 point return during the 5 games of the 2007/08 World Championships saw him claim more than any other player in Division 1 where Austria, Kazakhstan, Poland, the Netherlands and South Korea provided the opposition. Team GB finished fourth that year but would go one better the following season – Chambers again making his mark with more assists than any other skater to help claim a Division 1 bronze medal for his adopted country. He was then ever present for his nation again in 2009/10 but now the former international, Elite League and EPL champion will be concentrating on the Invicta Dynamos as he moves to Kent for his first taste of the NIHL. “We talk about players joining us at this level with an EPL history but Greg really has done it all. He is an Elite league winner, an EPL winner and was playing for Great Britain as recently as 2010 – that’s a pedigree you can only dream of in the NIHL. He has a wealth of talent and is the type of player who goes out and makes things happen on that ice and I’m sure he’s going to be a stand-out performer for us in 2014/15. Greg has shown an interest in coaching and with his vast history and knowledge of the game that’s not an opportunity we would turn down. As well as occupying one of our two import spots he will join as an assistant coach and I am looking forward to working with him when the new campaign gets underway in September”.